We have a fantastic Peak District trip coming up on the last May Bank Holiday weekend (25th-27th May). 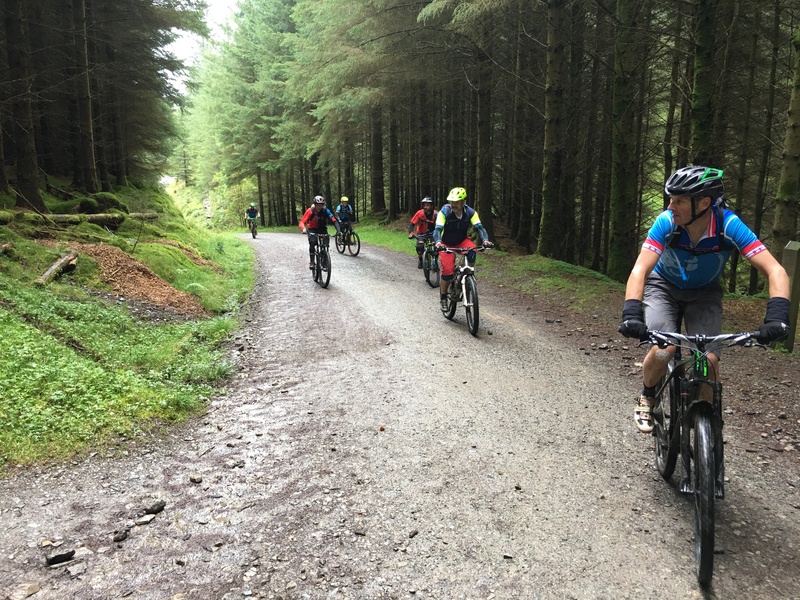 3 days of fantastic views and riding on offer, with routes for all. 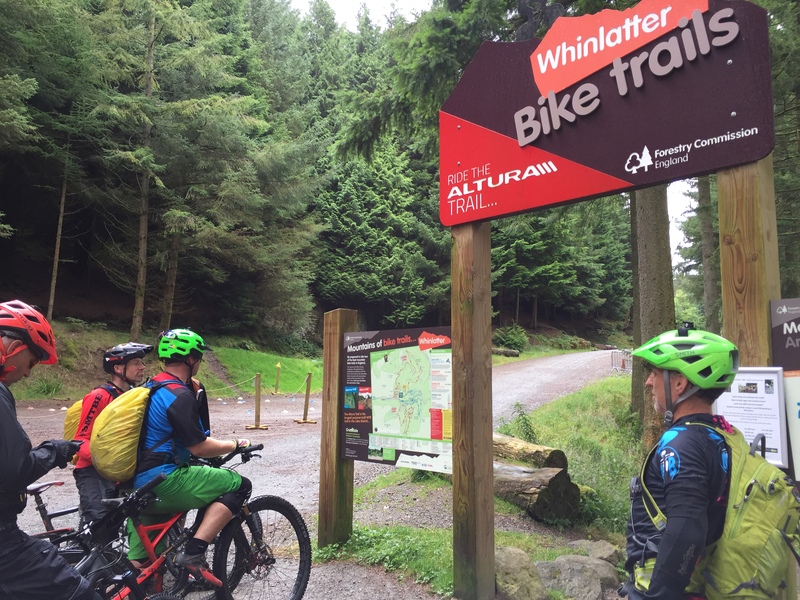 Monday afternoon we opted for a visit to the Whinlatter trail centre as a final session to our few days of epic riding in the Lakes. 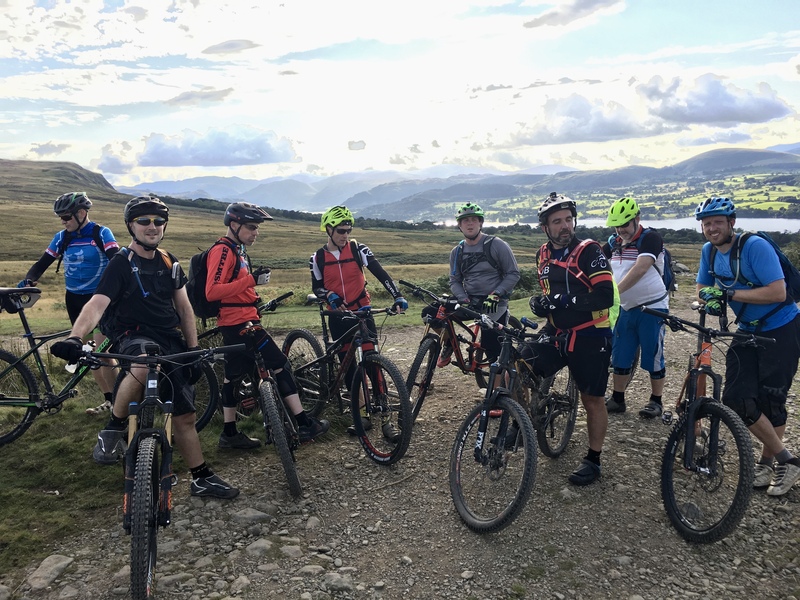 After a swap to hardtails for Dave and Andy, a quick bite to eat from the cafe and an essential browse of the shop (some nice Yeti’s on offer if you’re interested) we set off…. oh no, hang on, just a little more faffing while Sean replaces his hanger and reattaches his rear mech. 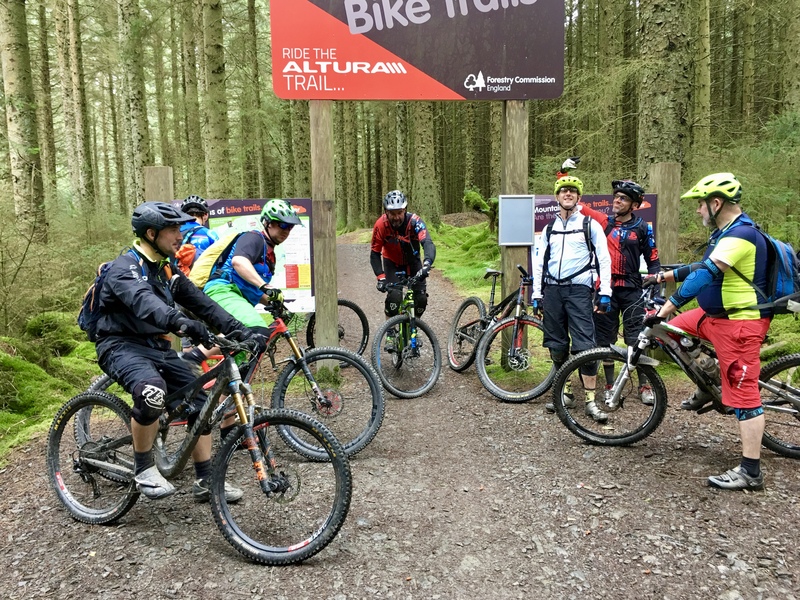 We’re now ready and head out from the car park with the rain just holding off for a lap of the Altura South red trail. A quick stop at the trail start for a photo opportunity sees a lady on an e-bike go bombing pass. A quick wrap up on the photos to give chase however she appears to be long gone. The trail starts nice and gradual with a fairly wide track through the trees before opening out on to a fire road. A short stint on the fire road before getting back on the single track for the first part of the climb. The trails are nicely built and are mainly hard packed surface with some small rocky sections and switchbacks taking you up. Half way you cross another fire road and we bump into the e-bike lady and yes we all beat her to that part and even she took the fire road the whole way so not a bad achievement really considering we’re all starting to feel a bit jaded. A bit more climbing, with some tight switchbacks that almost saw Matt doing a complete 360 and we get to the top. Now starts the descents that initially have some really large rocky sections that now that it’s raining make them rather slippery and line choice that bit harder. Andy went first but wasn’t long until he was no longer rubber side down, followed closely by Dave who also decided closer inspection of the rocks was needed. After these rocky sections the trail opens up a little and starts to flow with some smaller rocky sections and the odd little drop thrown in. This brings us nicely back down to the midpoint fire road and the start of an awesome little section with a series of small table tops before leading into some berms and a really nice fast and flowy descent. A quick chat at the end to some local boys for directions on how to pedal back up so that we can give this baby another try – loved it, big grins (from me at least!). After a second run, we finish off the last small section of decent that brings up back down to the trail start. A cross of the car park and we get to the start of the North loop. 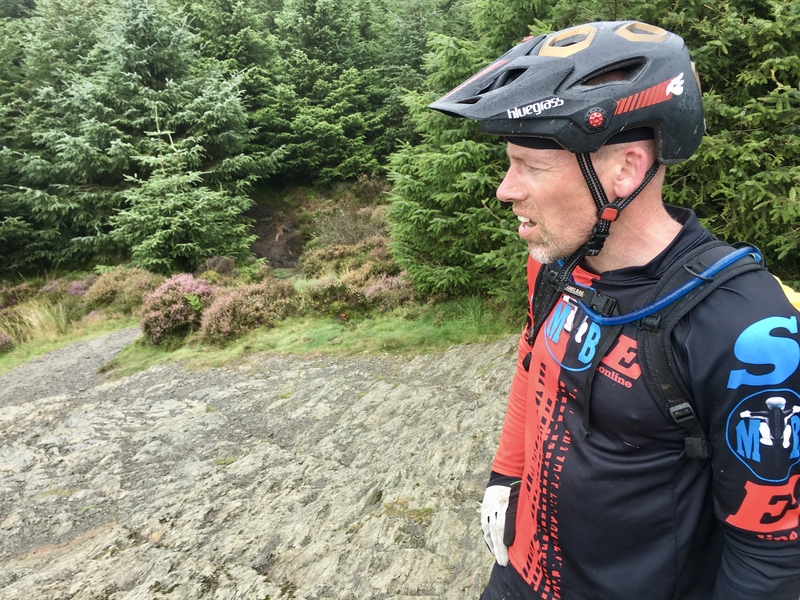 This starts with a tiny decent, like 2 seconds worth, before knuckling down to about 5kms of climbing, with a mixture of single track, fire road and a rocky technical climb that put Andy’s gear shifting to the test. On closer inspection we it became evident that the cassette on Andy’s bike was very loose which seemed like a relatively easy fix, however this proved to be fatal and sadly the end to Andy’s ride – by the freewheeling back down. Those remaining have a long section of fire road climbing that see’s Dave, Matt and Rob zoom off as though they’re on fresh legs while the rest of us take a slightly steadier pace up. The decent on the North side starts in the forest and has some nice tight sections and turns with some drops thrown in for good measure, really fun. A little bit of a pedal though the trees brings us out to the final decent, although by this time the weather had really set in and I think we’re all just on a bit of mission to get back down, so a bit less chit chat and on to the final section. 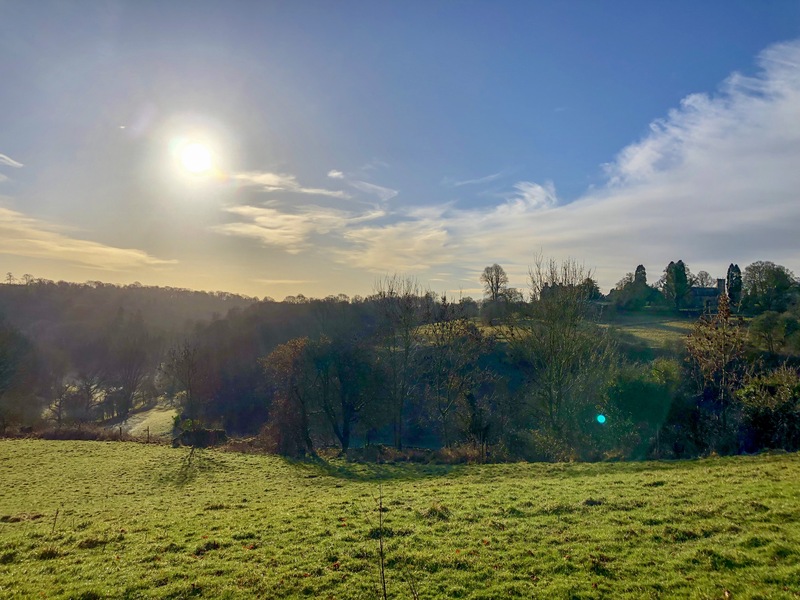 This starts in the open with a series of large berms with loose-ish, gravel surface that open out to some very large and steep drops if you were to overcook it – a little bit of the Alps in the Lake District, but not one you’d want to get wrong. The final section takes you back through the trees with a fun and fast descent that leads you back to the car park. For me, Whinlatter was a little bit like CwnCarn, but really really enjoyable and most definitely worth the visit. Still in the rain, a quick re-pack of the bikes brings to a close what can only be described as possibly some of the best riding you may ever do in the UK. Still, all good things must come to an end so what better way to wrap it all up than a pint of Cocker in the pub. After the long drive up we finally arriving at the New Ing Lodge in the quaint village of Shap, just off the M6 on the side of the Far Eastern Fells and were all made to feel very welcome by Emma and Scott the owners. Eager to ride, we quick changed into our finest MTB kit and followed our guide Charley in the vans for a few miles to a moor top carpark by Helton. Weather conditions and injury thwarted this ride in April on Andrew’s and my recce weekend so while on holiday with the family last week I took a day out to test ride the route in readiness for September when weather permitting six hardy souls and guide will head to the top of England’s third highest Mountain at 950m and make the classic descent to Glenridding via Stick Pass East. I met Charly my guide and good mate to the injured Nigel Piling (our guide in September), in the carpark in Glenridding. Charly came over as a really nice guy and proved to be, as well as an athlete and talented rider. 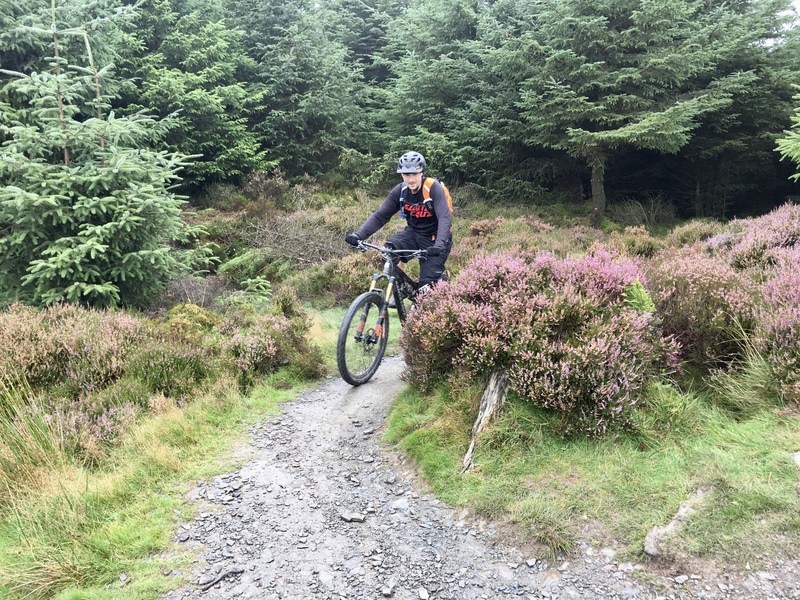 At present he works for International Mountain Bike Magazine as product review, so turned up on a Polygon carbon DH bike at £5.5k load for a review. Nice job if you can get it. After a chat and kit check we headed west out of Glenridding up Greenside Road in glorious sunshine. 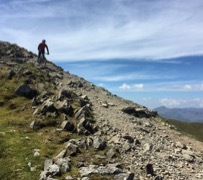 The road giving way to concrete then gravel track that steepened to a point that proper bike on shoulders hiking was required for a time before remounting and passing Greenside and the grassy slopes of Stybarrow Dodd. Here to be met with a long but smooth packed gravel and grass descent littered in small rideable rock down to the saddle where Stick Pass crossed west and east from Therlmere to Glenridding. Heading south Charly and I rode the lower skirt of Raise before once again bikes shouldered we walked to the top taking good note of the steep loose rock surface we would attempt to ride back down on our return from Helvellyn. 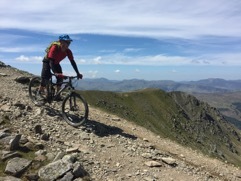 This first true test of riding skill to come stuck in my mind as we rise and fell along the plateaued ridges of Whiteside and Lower Man before arriving to some surprised faces at the trig point marking the summit of Helvellyn. There we sat on the edge of the col and lunched in light winds and sunshine Red Tarn more deep blue in the reflected skies. A few selfies and a one by a passing exuberant American tourist amazed to find 2 Brits with bikes on top of the mountain he had just puffed and panted up, we rolled back towards Raise and the 150m drop to the beginning of Sticks. Other than one tight turn where we had to wriggle between large boulders dabbing required I was pleased with my efforts and descended back to the fast flowing lower section, where speed and indecision ended in a parting of body and bike through the side door. I foolishly opted at speed to leave a stone filled rut and make for the smoother walkers path, the transition between the two at speed looking much shallower than it actually was. I have learn from years of walking these hill to give them respect, a slide across the grass at speed avoiding the stones that litter the surface reminding me that on a bike this respect is just as pertinent. The top of Stick Pass is smooth and flowing with natural berms and rollers, the terrain enough to trick the mind that one is riding a trail centre; The steep smooth descent lulling one into a false sense of security, as soon we found ourselves on rockier single track with pinch point boulders and cutting to ride over or between. Picking a line well ahead became imperative as the descent became more and more gnarly, hanging off the back of the saddle with speed enough for the front wheel to rise over the boulder littered path while picking our way through a moonscape the only successful way down. Of course Charly glided over all with ease while I managed with a few refusals at particularly large drop offs. That is but for one particular line that I took on a tight bend that lead to nowhere, the actual line much wider around the bend avoiding a big drop on the rocky out crop I followed. Faced with a severe but ridable drop but the prospect of landing on a bed of ostrich egg sizes stone I anchored up, nearly saved the tumble off the ledge and the gravity bill paid with some large bruise. My advice to those in September, pick your line and full commit there is no room for bottling, ride what is in front of you look well ahead. After my off it was the turn of my newly tubeless set up to fall fowl of the tough terrain, the tyre derimming and tube having to be installed before another section of gnarliness before the rocks. These subsided and gave way to fast flowing track to a gate that re-joined Greenside Road and the concrete to tarmac that lead to the Travellers Rest for a well-earned pint of Helvellyn. To summarise: This ride is immense, the most taxing and technical I have ever ridden. Helvellyn is my favourite mountain in the Lake District and to have ridden it and Stick Pass gave me great pleasure. The route, terrain and weather conspired to make this the best ride of my life. What we do is called mountain biking. That is exactly what this ride is and it is truly awesome!